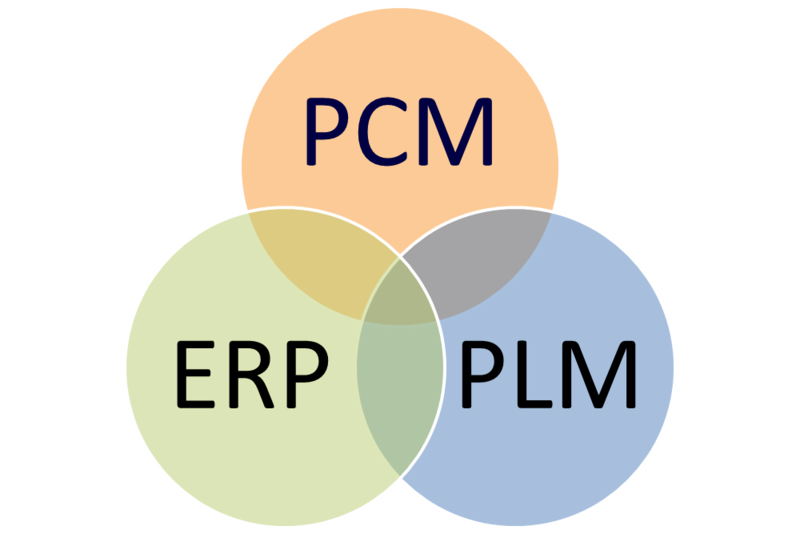 PLM, ERP, and the Effect on Product Cost Management If Your Company Does Product Cost Reductions, It’s Already Too Late 2012 Revenues in the Product Cost Management Software Market New! 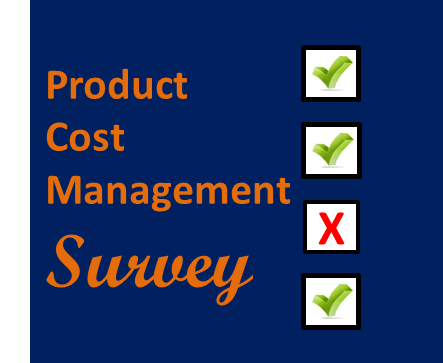 Product Cost Management Survey – Participate now!!! Dale Matteson • I have found that when product cost targets are not met it is because there was a failure to accurately understand the up front requirements and fully take into account the resources required vs. what is available. You only have 3 resources time frame, money, and skill set of the people available. 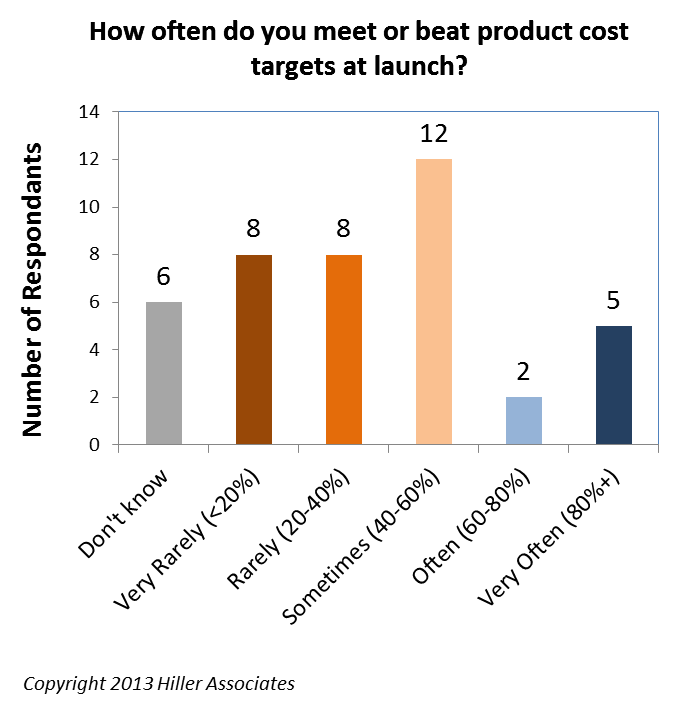 failure to accurately identify all three is the reason most cost targets are not met. Eric Arno Hiller • Is that similar to the old software product management triangle of the following? I don’t disagree that many companies don’t understand requirements well. However, I see many companies that do understand requirements, but still make inadequate effort to discover what those requirements will cost to deliver. Dale Matteson • I understood that you are talking about the ability to hit the origional production cost targets when the product is launched. An example would be the origional Mustang. The goal was to make a car that sold for $1 per pound. That is what Ford determined a person would pay for a second car for dad to drive to work and be able to enjoy it. In fact they missed the target. If my memory is correct it came out at about $1.10 per pound. Electronic products are a little different. My experience here is engineering estimates the parts that will be needed and they are priced out based on current information available. Unfortunately I have found that most engineers are very optomistic on component values and quantity required. That is usually the cost driver for electronics and not the direct labor. That’s certainly fair. Electronics runs by a different set of cost physics than heavy mechanical content product, such as the auto example you mentioned. Electronics seems all about standard parts, scale, massively dropping prices, and obsolescence? Peter Wallach • The variations of Product cost can generally be appropriated to labour evaluation, whether it be skill set, time evaluation or process change. Quality control, material cost should be known prior to market exposure. The development cost is a factor associated with quantity. Just to clarify, I am not speaking in this article about development cost, if by that you mean the cost in engineers, prototyping, etc. to design the product. 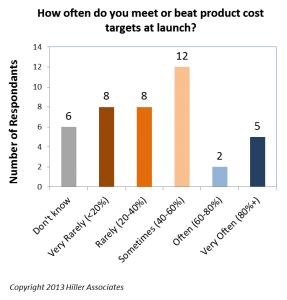 Dev cost would be under the R&D line on the income statement and is typically 3-5% of revenue in a manufacturing company. 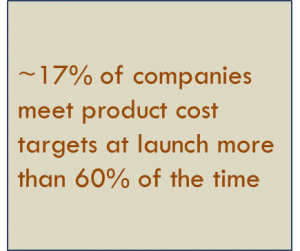 I am speaking of the cost to product the product, which is typically 70-90% of revenue and largely contained in COGS. I agree that raw material cost should be known prior to launch, but typically we see that by the time it is known, it is too late to take meaningful action, and the product launches over cost. Is this not your experience? I do believe that annual adjustments can be made to sell price, allbeit after launch. At this stage it is possible to increase sell and provide additional margin. Regardless, of how many vertex that the polyhedron has, I think we are all in agreement, as you say, that the poor sighted will always say: “we can fix that later”, with respect to product cost. Ed Danzer – The complexity of a project and optimistic expectations are common causes missing profitability. No one starts a project knowing for sure what all the possible constraints are unless it is just a repackage project. I suppose that is true, but do all the clients you serve have a good idea of what something will cost when they go out for bid? How about when they are designing the parts in the first place? What would you say is the general product cost knowledge of most design engineers today: 1-5 (1=Very poor, 5-Very good)? Ed Danzer • Understand cost is very project dependent. Most of the projects we get involved in have lots of areas of concern so the chance of a problem is quite high and there will probably be delays. Many design people have limited product cost knowledge because of a lack of exposure. A person learns by experience so if you only do a few projects per year and they are all different you may never get good at figuring costs. With low volume sales items it is even more difficult to have a consistent cost of manufacture in complex products. We sometimes have the second item cost more to manufacture than the first which can be frustrating. This can be caused buy many different reasons so it is hard to avoid in the design process. An example of lack of design knowledge is very few people understand the cost of holes that are greater than 3 times the diameter deep or using a milling tool with more than 3xD long. Yes, the hole example is good and fairly classic. We you say that the “We sometimes have the second item cost more to manufacture than the first…” are you saying because the first order was bigger and the set-up costs were better amortized? These products are usually built one at a time and several month apart so it may be that record keeping is better, there might be a tolerance issue that did not show up in the first unit or there might be a vendor variation that was missed. With a product that has several hundred parts the chance for error goes up with the number of components. Oh, I see. You are talking about an engineering change / specification mistake problem, or a process control / stabilization problem on the mfg side. Certainly, I can see where that would cause cost problems. I can see their frustration if the problem is on the mfg side, but if design mis-specified, it seems logical that there might be a cost change. Murali Cherat • Compliments to you Eric. U kept me glued for over an hour ever since i clicked on your title. Pleasure to say hello again. Murali, thank you for your kind words. It is nice to know that my efforts are being heard and are of value to folks. Joe Szpak • A huge part of this is lack of good communication between the people in design and in engineering and another perhaps even larger part is mechanical and or design engineers with little to no manufacturing experience. This is a problem I see on a daily basis and it is a huge part of what my company does. We take existing or new products then re engineer them to make them economical to produce. You would be amazed at how some engineers will design something nearly impossible to machine or add tolerances that are plain crazy or even use materials which are way too expensive. This is 100% due to the fact that these engineers have no shop floor experience and that should be an absolute requirement for a degree in mechanical engineering. I work with a lot of engineers and I can say for a fact that a guy with shop floor experience is 10 times the engineer that the guy without it is even if the shop floor guy does not have formal schooling or a degree. I will in fact say there are engineers out there with several degrees that are pretty much worthless when it comes to design for manufacturing and this drives the cost of products through the roof. This is a serious problem and a lot more common that you would think. Eric to answer your question I would give the engineer a minus 5 in 75% of the cases based on the dozens and dozens I have worked with over the years. I mean to not know a simple thing like it is impossible to machine 3 intersecting planes without an allowance for a radius somewhere or to put a .03 radius on the inside wall of a part 6 inches deep and expect to be able to machine that using conventional means is something I see all the time. If that guy was to try to machine a pocket 6 inches deep with a .06 diameter endmill even one time he would know not to ever design something like that. What happens instead is the shop is forced to go with added process like EDM to get these features and that pushes the cost through the roof. A mechanical engineer with a solid background in current machining practices and manufacturing methods is an absolute must at the very beginning of any kind of project. If a company thinks that is a step that can be left out then there is a very good chance their product will be far too expensive to produce. If this very serious problem was addressed I think that a good portion of the work being out sourced could be more economical to produce back here in the good old USA. Joe, thank you for your comment and insight. Sadly, I hear this all the time from a lot of people. Where does the blame lie though? I think most of us would agree that most degreed engineers, especially those from top ranked engineering schools, are “intelligent” people — far more intelligent in raw neurons than the general population. Most are also pretty motivated people, or they would not have made it through engineering school. So, if they are intelligent and motivated people, why does this problem not only persist, but also appears to get worse and worse? Is it as easy as blaming modern engineering educational pedagogy? Or, are there other things at work? I mean the gross examples everyone gives (such as yours above) are so bad that presumably a night class for 6 months in product cost management / design-to-cost / DFMA, etc. would solve 80% of these problems. Yes? No? Eric I am not saying a lot of these guys are not very bright , lack of training does not make one stupid but it does have a huge affect on the ability for them to do the job. A class on machining would probably help but it would not be anywhere near as effective as putting these guys on a machine for a year or so. Once you see what it takes and have to do it with your own hands it gives them a much better idea what it is like to have to manufacture these parts in the real world, it is simply not something that can be taught as well by taking a class. Ed part of the problem is some of these engineers do not even know about some of the new manufacturing methods available to them in fact they do not know about methods that have existed for years in some cases. Without a good back ground and the knowledge of how things can be made the products they design tend to be way out there on cost, I have seen this time and time again. If it takes more training then so be it, if we want to have a manufacturing base that can compete we need highly qualified engineers in it from the start so the extra training is something that should just be accepted. You would not want a doc to cut your skull open if he only had online classes right. As in every aspect of the manufacturing industry training is the key and from what I have seen the training is just substandard not only from the engineering side but from the vocational side as well. I don’t know what the solution is, the schools are profit driven so they of course are going to do as little as possible to generate large profits after all that is the reason they exist. I am a big advocate for in house training it is the only way I will do it anymore and I would rather bring someone in with zero experience than to have to un train them from bad bad practices. I have tried on several occasions to bring in people from the local schools and I have been shocked at what they are teaching them. The classes seem to be based on high school metal shop rather than real world up to date machining. Some of these guys just have no idea how much it costs to hold a tolerance of +/- .0002 when it could be +/-.010. Ed a good machinist knows what can be machined and the most efficient method to use to do it the design constraints are the problem at that point because the design is already done so it is too late for their input. The whole point is never to have that drawing reach the shop floor if it is designed in such a way as to make it near impossible to manufacture in the first place and that is why the collaboration between design and manufacturing is so critical at the early stages. If the company does not have an engineer with shop floor experience then they should have the person on the floor that is going to have to make that part in on the process. No one can know it all but product development requires input from as many people that will be involved in that process as possible if it is to meet target cost, that includes all the way to the end in things like packaging and shipping. I realize that a practical internship on the floor is a the best idea, but there are too many manufacturing processes for the designer to spend even one week on each. I do remember being a young engineer at Ford Motor Company and they had a wonderful 6 week New Employee Orientation, including visits to dealerships, classes on various technical subjects, team building stuff, individual and group design projects, and they even had us spend 3 days on the line with the UAW guys (I was pushing wiring harnesses for Crown Vic’s — it was like trying to wrestle and octopus!). So I think we do have to rely on some sort of training / education which only some limited floor time. I just don’t know if such a thing is develops – other than in boring mfg textbooks! Eric I am not suggesting hands on with every form of manufacturing I know that would not be practical however 1 year of hands on in a general machining environment should be mandatory for all mechanical engineering degrees. Something along the lines of what a doc has to do with the internship seems very reasonable to me. As far as keeping up on all the new methods in manufacturing there is simply no excuse for not doing that it is part of the job description something we all do on a regular basis and all it takes is a subscription to a few of the many many trade mags out there and a willingness to learn. If they do not have that willingness to learn then they are not worthy of the position to begin with in my opinion. Training in almost any form is a continuing process if you want to be on the top of your game and there are engineers out there that are top notch and know about the manufacturing methods available and know just what it takes to make a part. If there are engineers out there like this already then it means this is not an unrealistic expectation for all engineers to have that same knowledge. Maybe it takes the right individual that has that drive to learn as much as he or she can I don’t know but it is an undeniable fact that the hands on experience makes the difference between an average mechanical engineer and a great one. An average one is going to design products that are more complicated and more expensive unless he or she is willing to also work with the person doing the manufacturing. Some of these guys have egos that won’t quit and you can not tell them anything because they have multiple degrees and are really smart, yea OK. Some Engineers are very willing to listen and learn, the ones that do will end up being 3 times the engineer that the other guy ever will be. The other guy can use his degree to paper the bottom of his hamster cage because that is all it is worth. This is a real shame but it is also a fact and the really bad part about this is that over the years I am seeing less and less with this experience in the work force and seeing more and more that do have the experience in it retiring. If this country does not do something about the training and education system we have we are going to be in real trouble in the very near future just like we already are in the manufacturing sector with the lack of skilled help available. Ed Danzer says: There are many things that make designing for manufacture difficult. The training for engineers could add one year to getting a degree. Depending on the industry the person works in can have an affect on what is considered cost effective. If low weight is important the cost will be higher. Just because a machinist thinks it could be made easier to make does not mean it is possible given all the design constraints. Some processes like hard turning, hard milling, splines, gear teeth and broaching can be very cost effective if the right shop does the work but finding this shop can be difficult. I tried to be a virtual manufacture from 2001 to 2003 and found many shops cannot do some jobs cost effectively so we now have a complete machine and welding shop. @ Ed Danzer That is very interesting. I personally am a big believer in real people doing real work on real machines in the USA. And, maybe it is hype, but you do read a lot about re-shoring of work. A big problem i see is that we are being asked to sell parts to a model more and more. A lot of Catia based models have a general tolerance of +- .005 on the entire part .including fillet radii and edge breaks.It drives cost up and is not necessary. A lot of common sense features like standard size fillet radii that have have to be penciled off with a ball end mill instead of using a standard tool with a radius on it can kill profit on a job when you miss it when quoting. @Kristian — No doubt you are correct, which boxes with the comments from Ed and Joe. However, it is an interesting root cause analysis, i.e. that the designers are not even consciously putting over engineered tolerances on the part… that CAD system itself is. I believe the biggest challenge to achieving the production cost target is created during the earliest project development phase, defining the product specification and establishing a realistic and achievable target cost. Most companies do not have a reliable method for doing this. Typically they rely on historical data or estimates of competitor costs to come up with a cost target. 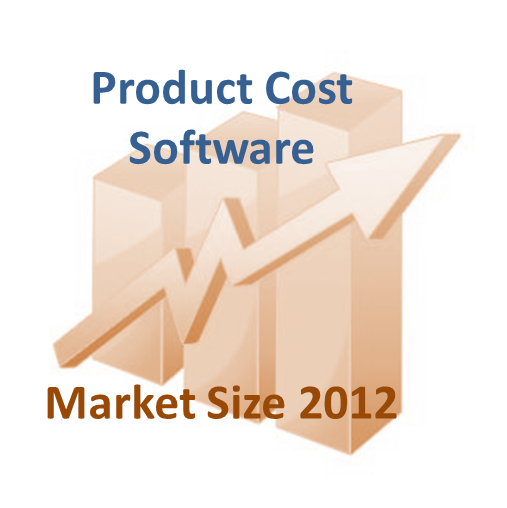 I am pleased to say that there are very good tools available to develop a reliable estimate of product cost. Using parametric estimating software, it is possible to develop a very accurate estimate of the product cost in the early “concept” phase of a new product development. 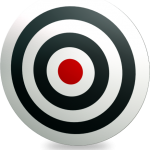 I work with a company that has developed a fully integrated cost estimating software suite that will improve the chances of companies in hitting their cost targets. Anyone who would like information about the software and services offered by 4cost GmbH, please e-mail at aldigio@4cost.de. Alan, I agree that cost is a bit of a chicken and egg problem. How can you control it if you have no good, believable target that the design teams buys into? I would be curious to see your capabilities.